Strasbourg, Grande-île and Neustadt comprises the medieval historic centre of Strasbourg including its Cathedral and its German-built New Town. The Grand Ile started out as the Roman camp of Argentoratum, and developed itself into the free city of Strasbourg. It was an important commercial centre in the Middle Ages. Johannes Gutenberg created the first European moveable type printing press here in the late 15th century. The gothic Cathedral was the principal element of the WHS nomination, both for its artistic and technical value. Construction of the Cathedral of Notre Dame started in the late 12th century. A team coming from Chartres suggested a high gothic design. Pink sandstone from the Vosges was used for the construction. It has one 142m high filigree spire (the second one was never built). The height of this spire was unequalled until the 19th century: it was the world's tallest building from 1647 to 1874. The design of the cathedral became very influential in Germany. The ensemble on the island Grand Ile also consists of several old churches and a network of (post-)medieval streets. Their names reflect the guild movement, from the tonneliers to the tanners. Black and white timber-framed buildings adorn the streets. Among the medieval buildings are the monumental Ancienne Douane (old custom-house) and the renowned Maison Kammerzell. The imposing structure of the Strasbourg Cathedral can best be admired from afar. Already kilometres before entering the old town by car, the cathedral’s spire dominates the skyline. What a sight this must have been during the Middle Ages, when the area wasn’t as built up as it is now. It has inspired Cologne Cathedral – and indeed they look alike apart from the exterior colour. This was my second visit to Strasbourg. I had visited it before in 1981 with my parents. I had ‘counted’ that as a WHS visit but always felt a bit bad about this because I had no memories of it at all. 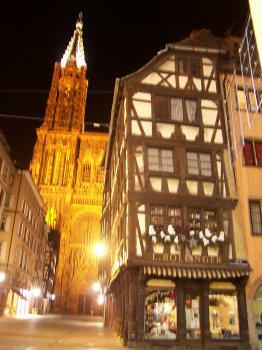 Now, over Easter, I stayed in Strasbourg for two nights on a proper visit. I found a town very popular with German tourists. Also, the Asian tour groups know how to find it. There are plenty of restaurants too and it’s all quite touristy. On Easter morning I started with a walk along the River Ill. There are cheesy boat trips on offer here, like in Amsterdam or Paris. I continued on foot to the bulky St. Thomas Church, dating from 1196. From there a foot path starts into the Petite France neighbourhood. This is the main tourist area with pretty Fachwerk houses and streets named after the guilds. Then it was on to Palais Rohan. A pretty 18th century palace which houses three museums. Entrance was free today, and I choose the Museum of Beaux Arts. It has numerous paintings by well known Italian and North European painters from the 15-18th centuries. One has to be a real art enthousiast to enjoy this room after room. Finally I entered the Cathedral. Mass was going on so I couldn't go around much. What attracts the eye immediately are the huge and pretty organ and the various stained glass windows. 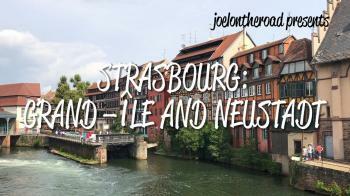 My wife and I stayed for a week in Strasbourg in August 2017. It's an extremely beautiful city, not too touristy, much more affordable than other French cities (especially Paris), and there's quite a bit to see. The area known as Petite-France with its picturesque houses, the lovely canal, the imposing Notre-Dame cathedral and of course the little alleyways running everywhere. 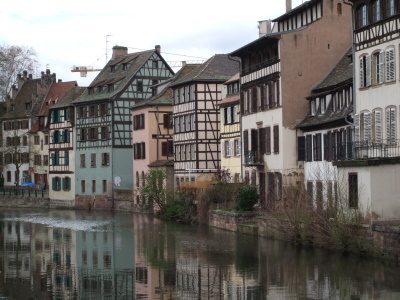 Recently, Strasbourg was extended as well to cover another area, the German-developed Neustadt or New Town, located across the river from the medieval city. It's striking just how different the planning, layout and architecture is over here, representing the development of new European ideas, particularly after the revolutions of 1848. Check out the link below for my full video review! I visited Strasbourg a couple of weeks ago during my holidays in the Alsace. As always when I visit a UNESCO site I tried to figure out the exact parts forming the inscription.In Strasbourg that is quite easy: it is the Grande Île surrounded by the two arms of the river Ill . It is supposed to form the old city dating from the 15th to the 18th century. On the map this seems a very elegant and convincing solution. But while the area around the magnificent cathedral and along the southern shore of the island refers well to this description you have two walk just a few blocks north to find a mix from very different periods including buildings on the 19th and 20th century. Among them many modern buildings with no historical connection or asthetic value. Are they also protected by UNESCO and cannot be altered? On the other hand you find just south across the river of the Grande Île the Krutenau, originally the fishers' quarter dating from the 13 century and one of the nicest areas of the city. Here you find many half timbered buildings, Renaissance palaces and especially the hospital. One of the oldest hospitals in France it forms a whole city block with the hospital gate from the 14th century, the last remaining gate of the old ramparts, the hospital chapel and a huge hospital building from 1725 that replaces an older building destroyed by fire. In its basement you can visit the medieval wine cellar that is still used to support the hospital, a practice also still in use at the hospital of Beaune and a very French way to support a charitable cause! Just across the river to the north-west off the Grande Île there is another impressive building complex that does not seem to be included: The Commanderie de Saint-Jean, first a monastery and hospital, later in prison and nowadays an elite university. As nice as the concept seems that the old city is congruent with the Grande Île the reality is different: The old city stretches along the southern shore of the island on both sides of the river while the north of the island is from various periods. 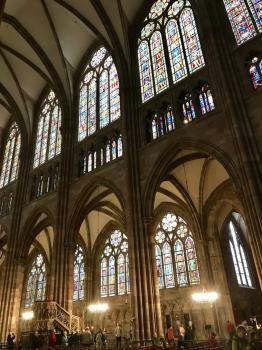 While Strasbourg is a delightful city to visit and walk around the only building of real individual OUV is the Cathedral. If you look for a city that reflect the late medieval or the Renaissance period Colmar and Besançon for example are more homogeneous, splendid representatives of their period. This proposed extension should incorporate the historicist architecture of imperial Prussia into the Straßburg WHS. The area is adjacent to the Grande-Ile, but its style is inherently different. The architecture is of monumental scale and aimed at openly demonstrating the contested Prussian rule. Some of the most significant buildings surround the Place de la Republique (formerly Kaiserplatz). The architecture reminded me of what survived from imperial Berlin and is also similar to the monumental square in Munich once proposed as a WHS. The area can easily be accessed by foot from the historic centre of the Grande-Ile, however, most of the buildings are closed to visitors. An exception are the municipal baths, which I believe are also included. The extension is justified by showing urban continuity across cultures as well as representing German imperial historicist architecture destroyed elsewhere. I am not sure how convincing these two arguments are. Urban continuity is probably there and the styles are certainly distinct, but on the other hand, this might affect the integrity of the WHS. European historicist architecture might not be represented in Germany, but there are already several such examples on the list from other European countries (Paris, Vienna and Budapest, among others). I have visited this WHS for more than 30 times since I also work there. The highlight of this WHS is surely the tall Cathedral. Every year there is a sound and light show projected on the cathedral facade which is really worthwhile seeing. The Petit France is also a cute part of town. On a sunny day, I would suggest going for a stroll in the Orangerie Park especially in Spring when several White Storks can be seen nesting and roosting. As things are a bit spread out in Strasbourg I found a day ticket for the buses and trams invaluable at 3.60 euros. It enabled me to visit the Court of Human Rights, the European Parliament and the Council of Europe buildings in addition to Vauban's barrage and Petite France as well as the cathedal, churches and palaces on the Grand Ile. Strasbourg changed hands several times between France and Germany in the course of history and the architecture reflects these current changes: the medieval half-timbered houses are typically Alsatian but certainly more related to such architecture in Germany (like in central and southern Germany) than in France (like in Rouen). Conversely, the Baroque architecture as in Palais Rohan (which houses three museums) is typically French reminiscent of such buildings in Paris. The Musee d'oeuvre de Notre Dame is a must-see, exhibiting beautiful sculptures from the cathedral as well as other medieval art. Apart from Bains de Cluny in Paris, it is probably the best of its kind in all of France. The building itself is beautiful as well. I have to admit perhaps my favourite places to visit are these medium sized European cities, and Strasbourg was definitely well worth a weekend break. The city centre is on an Island (Grande Isle) and its main assets are two fold, hopefully shown in the photo. Firstly rows of half-timbered houses overlooking cobbled streets/ waterways. Secondly the massive Gothic Cathedral. It was regarded by Goethe as the finest Cathedral in Europe, and its main edifice certainly ranks up there with the best. Inside is a fine astronomical clock, which like every other one I have seen is achingly under whelming to watch in motion on the hour. The area of Petit France is incredibly picturesque, with the canals being lined with black and white houses, mostly filled with restaurants (some are very good!) now but still a great place to amble around. We spent most of our time wandering around trying to avoid spending our whole budget in bakeries and sweet shops, there are a lot of them here. Also on a culinary note Strasbourg gets high points in my book for being situated in perhaps my favourite wine region, and I really enjoyed the aromatic white wines on offer. If you do visit try to have at least one glass of Alsatian wine, the main varieties to look out for are Guwurtztraminer (my personal favourite), Muscat and Riesling but there are plenty of others to fit your own palette. I really enjoyed my weekend in Strasbourg and its continuous development is a great testament to how many European cities have evolved, incorporating many artistic styles and practical uses. Strasbourg is mostly famous for politics, being both the seat of the Council of Europe and of the European Parliament, but the city's history and culture are at least as noteworthy. Having changed hands between Germany and France several times, Strasbourg still has a distinctly Germanic flavour, and the island-like Old Town has preserved its medieval core to a remarkable degree. Especially the Cathedral, or Münster, is very impressive. The entire Old Town is full of typical half-timbered buildings and is very pleasant to stroll through, especially since you always end up at the river. The Neustadt, or New Town, is located to the north of the Old Town and is characterized by wide avenues, parks, mansions, 19th-century buildings such as the University, and many diplomatic missions, as it is located between the Old Town and the international quarter, with the seats of the Council of Europe and the European Parliament. Excellent Tarte Flambé can be aquired in one tavern/gas station on a motorway from Strasbourg to Karlsruhe. From "Strasbourg-Grande Ile" to "Strasbourg: from Grande-île to Neustadt, a European urban scene"
Sundial: At the masons loge at the cathedral museum, formerly at the cathedral. Hospitals: The medieval hospital was destroyed by fire but its wine cellars survived the fire and are still active. Medieval buildings with significant 19th century murals: Strasbourg Cathedral has neo-Byzantine 19th c. frescoes in the Romanesque chancel. Inscribed in connection with an anniversary: To coincide with the "Bimillenaire" of the foundation of Argentoratum centred on the Grande Ile. Pope Paul visited the city that year. "C'est en décembre 1988, année du bimillenaire, que le vieux Strasbourg est inscrit sur la liste du patrimoine mondial de l'UNESCO sous le nom 'Strasbourg - Grande Ile '"
Frescoes or murals by famous painters: The Aubette Palace was decorated in the 1920s by Hans Arp, Theo van Doesburg, and Sophie Taeuber-Arp. 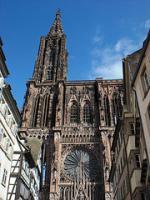 Protestantism: Lutheranism left a strong footprint on Strasbourg, and the Cathedral was protestant until 1681. St. Thomas now is the main protestant church. Dubbed as another WHS: The Aubette Palace was decorated in the 1920s by Hans Arp, Theo van Doesburg, and Sophie Taeuber-Arp and therefore dubbed the Sistine Chapel of Modern Art. 415 Community Members have visited.